Owing to our expertise in this domain, we are offering our clients a supreme quality assortment of Slat Chain Conveyors. Our chain conveyor is accessible in several specifications so as to meet the demand of customers. This chain conveyor is appreciated among clients due to its easy usage. 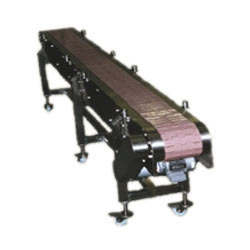 The chain conveyor offered by us is developed by using top quality of material & leading techniques following the set standards of industry. Specific Conveyors is the one of the well-known manufacturers and suppliers of Conveying Systems. Our company established in 2012 as a partnership owned firm and is indulged in offering a wide array of Take off Conveyors, Industrial Belt Conveyors, Industrial Roller Conveyors, Automation Systems and many more. We are 10 years experience in conveyor manufacturing field. Based at Hyderabad, Andhra Pradesh (India) Our organization is a perfect example of what seamless team work can achieve. Every team member is acutely responsible for his work status and area of application. Their team spirit and the ability to work individually as well as in tandem has created a healthy work culture that imbibes ethical work principles and sense of responsibility towards clients who repos it their money and trust in our capability to deliver them best of products and services. Our range is appreciated for dimensional accuracy, Symmetrical looks, functionality of working. We mostly export our products in middle east countries. Our advanced machinery and technologically advanced unit enables us to supply superior quality products that are in compliance with the international quality standards. We have a diligent team of professionals, which conducts tests based on several quality parameters, to ensure the delivery of flawless products and, in turn, attain maximum satisfaction. Further, through our after-sales support in the form of operational training for our conveyors and other products, we have been able to provide maximum satisfaction to the clients, spread across the length and breadth of the country, and maintain long term professional relationship with them. We always try to satisfy the requirements of our clients by sticking to the technical specifications provided by them. Further, in order to offer maximum client satisfaction. We are looking queries from all over India.